The moon woke me. 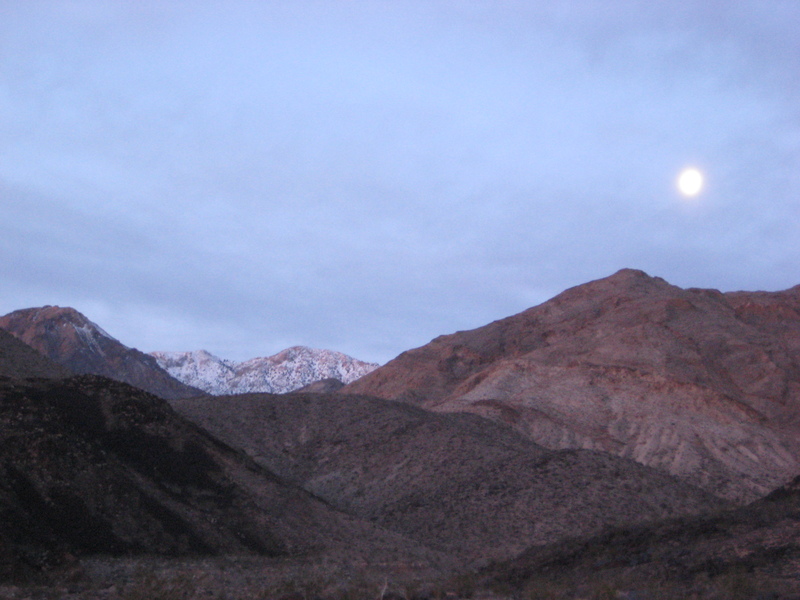 I was sleeping soundly in a remote wash tucked up a canyon in Death Valley, but when the moon rose to its zenith, full and fiery; I could no longer remain in my sleeping bag. I was compelled to rise and walk. Actually, I had planned to take a night walk anyway, so I was relieved when the moon pulled me out of my sleep rather than me having to force myself awake. The rain had finally stopped and the icy wind had calmed itself to a breeze, so this was as good a time as any. This was the third night of a four day vision fast. By this point, without the distractions of food and all the clutter that fills my life, time had really slowed down to a tortoises’ pace. 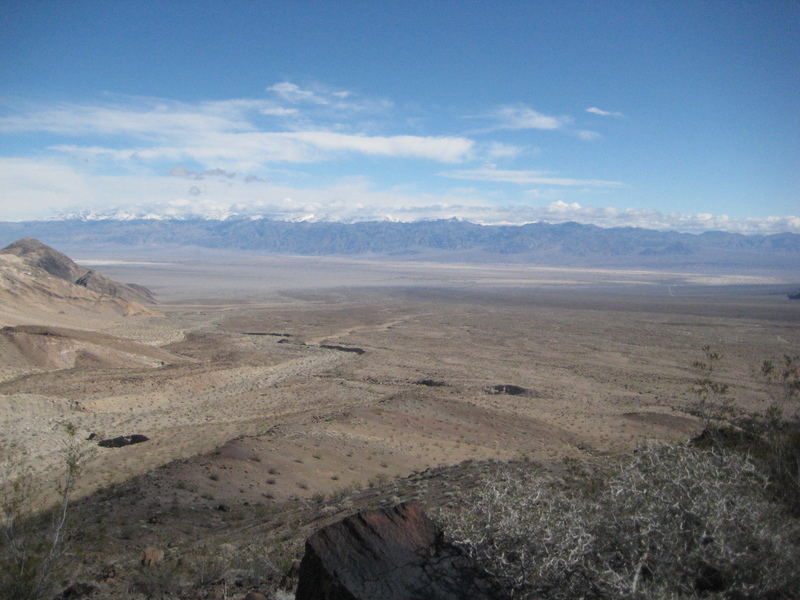 Although I was wet, cold and hungry, it felt good to sink into the natural tempo of the desert. It is a state of being that my body knows intimately. This simple act of sleeping on the ground and rising to the light of the moon reminds me of my evolutionary origins, which at times can feel as comforting as the warm breath of a lover. And yet, it is an aspect of myself that I can so easily belittle as sluggish, primitive, and unconscious. So, my intention for this fast was to find a new connection to the moon and to a consciousness that needn’t rely on such bright clarity; one that could withstand the ambiguities of nature, love, and creativity. True or not, I consider myself a highly rational person having spent the last ten years of my life in institutional academia. I am also dependable, responsible, and even tempered; all qualities that I admire. But lately, this rational side has left me feeling depleted and sterile, and frankly, resentful toward life. More than once, I actually caught myself fantasizing about personal catastrophes in the hopes of shaking things up a bit and to provide myself with an excuse to be a little crazy (which makes me speculate that maybe our culture’s current fascination with apocalyptic imagery is actually a grotesque expression for a desire to connect with the “crazy” unconscious). There has got to be a better way. I look to the moon. But the moon is crazy! The moon is nuts. Lunacy. Fickle and erratic. Light and dark. Helpful and menacing. Intelligent and absurd. Ask any woman (or any man, for that matter) how entering into the moon cycle, or confronting the lunar snub of menopause, can make one feel insane. Nevertheless, on this night, I followed her light along the path to the rocky mesa…until, that is, she forsook me for the clouds and all became dark. I felt shaken and disoriented. I could not find my way. I stumbled along, walking in circles, getting nowhere. And it occurred to me, “This is what it is like to walk in the realm of the unconscious”. And then I remembered him. I won’t say his name, but he is my inner guide. He came to me years ago. He is kind and smart and has a hearty laugh. An alchemist of old. Just saying his name invited a feeling of lightness. Soon after, I arrived at my destination. I said my prayers and made offerings. The rest of the story is secret, except I will say the sun did come up, quite unexpectedly, and it felt like Christmas. This I now know. The moon is fine. The feminine is fine too. She is my nature. She is nature. But without the discriminating light of the guide, in this case the helpful masculine, it is difficult, maybe impossible, to find connection to her. As Helen Luke writes, “when the feminine soil of which she is working refuses to come to life…she has then to learn to start from the receptive, the hidden, the goal-less aspect of Yin, and gradually the true light of the spirit will shine in the darkness, and the intellect too will be illumined and come to its fruition”. But, to me, it is all best said through poetry. all that is consumed with ash.